Why are you renovating the second floor? Over the past 17 years, we have changed cases, and altered two smaller galleries on the second floor, but have never undertaken a comprehensive renovation on this floor. Not only is it simply time to do so, but also this second floor renovation resumes the narrative thread from where the first floor renovation narrative stopped. What is being done on the second floor? The entire second floor will be given over to our new Kit Moncrief Galleries, including our new It's Never Just a Horse exhibition. We are taking the idea of the horse, and the horse itself, as our springboard to talk about those women who are shaping the West and changing the world. We have determined that we will focus on five main areas in which the horse, women, and the West are undeniably linked. 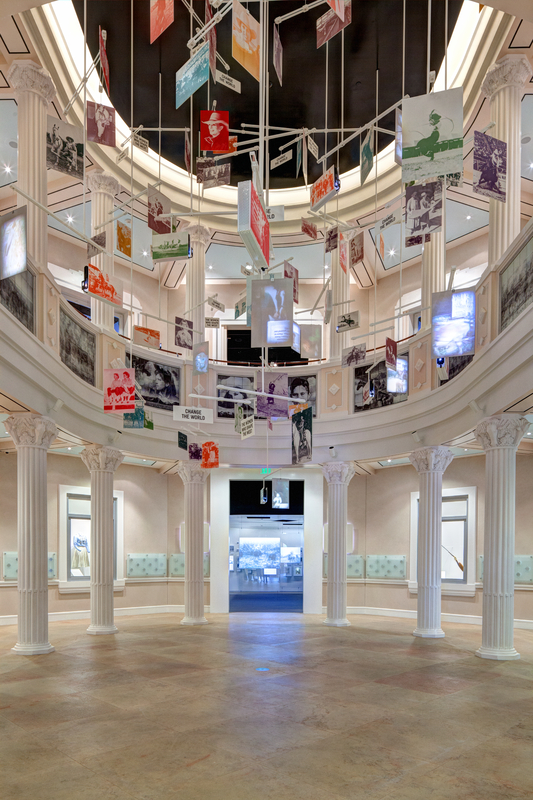 We are taking advantage of the latest developments in technology and museum design to showcase artifacts and develop educational opportunities. Why is the exhibition called It’s Never Just a Horse? It became clear to us as we undertook our research that the horse is many things to many people – and not just women. The horse can be a partner, a competitor, a muse, a lifesaver – and more: It's Never Just a Horse. Will the bronc ride still be included? Yes! The bronc ride is a beloved attraction, and it will be updated and included. What teams are you using for the renovation? We have engaged the architectural firm, Projectiles, for our second floor overall design:. They designed our first floor, including the innovative, 2-story mobile. Additionally, we have engaged the Projects Group and Bennett Benner Partners. What is the cost of the renovation? This is a 5.5 million dollar undertaking; naming opportunities are still available! Can we see a behind-the-scenes during the renovation? Follow us on Facebook, Twitter, and Instagram to see updates and progress. Are you still scheduling school tours in the first floor galleries? During renovation, we will not be offering school tours. Please check back with us once the second floor reopens for an engaging and unique experience for your students. How long will the second floor be closed? The entire second floor will be closed from February 5, 2018 until Spring of 2019. Why do you have to close for so long? This is an extensive renovation. All artifacts have to be removed and conditioned. Walls must come down, and the entire second floor must then be gutted and rebuilt. Is admission the same during the renovation? No. Our admission for adults is ½ off – and discounted rates apply for other groups. What can we see during the renovation? The first floor will remain open. This includes the Hitting the Mark: Cowgirls and Wild West Shows Gallery, the Anne W. Marion Gallery, the Shop at The Cowgirl, the dynamic two-story mobile, and the film lounge. Will you still be able to rent the building for events? Yes. The first floor will continue to be available at a discounted rate. Please email Tommy Morton. Can I still buy a membership or renew during this time? Yes! In fact, this is a great time to get involved with the National Cowgirl Museum as you will begin receiving our newsletter which will update you on progress, and you will be invited to preview events. Will the archives still be open for researchers? Yes. It will still be by appointment only. Please contact Bethany Dodson.